A propagation coverage map is a computer generated picture taking into consideration the frequency in use, geographic lay of the land and buildings located in the area. The output of the program is to display signal strength using colors. The hotter the color the stronger the radio signal. 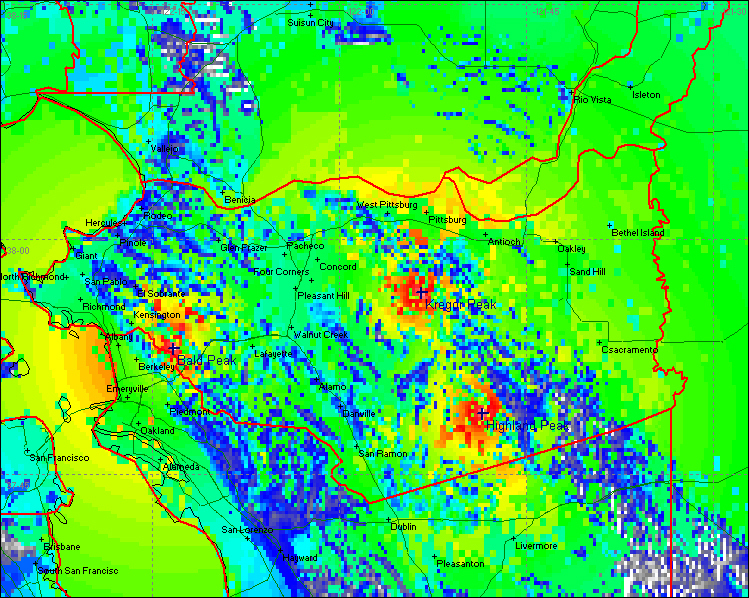 The below coverage map represents a composite talk-out map of how the 3 CCRA VHF repeaters cover Contra Costa County. A talk-out coverage map shows how well you will hear the repeaters using a mobile radio with an outside antenna and also how well you are able to get into the repeater radio system using the mobile radio with an outside antenna. The range of the repeaters are greater than the map is showing so one should not assume that the repeater coverage is just limited to the Contra Costa County borders.